Rosann is a part time member of our business staff. She started in 1994 working full time and is currently working three days per week. She did retire for a short time, but couldn’t stay away and came back. She has been married to her husband Dan for forty-one years. She has three grown children and nine grand-children. 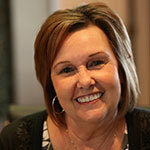 Rosann has been working in the dental field since 1990.